The Vatican synod on the family concluded over the weekend – with somewhat inconclusive results that were open to multiple interpretations. While there were many topics of conversation – including homosexuality, cohabitation and contraception – much of the focus fell on Catholics who have been divorced and remarried without an annulment, and the debate over whether the church would allow them to receive Communion. The synod’s final document, with each paragraph approved by at least two-thirds of the 265 voting bishops in attendance, did not take a clear stance on the issue, but some observers expect Pope Francis may leave it up to local parishes. Most U.S. Catholics (62%) think the church should allow Catholics who have been divorced and remarried without an annulment to receive Communion, according to a recent Pew Research Center survey. And only about a third of American Catholics (35%) say they personally think getting remarried after a divorce without an annulment is sinful, compared with half (49%) who say it is not a sin. Only 21% of Catholics say simply getting a divorce is sinful, while 61% say it is not. These views may be informed by the fact that many Catholics have had these experiences. A quarter of American Catholic adults (25%) have been divorced themselves, and roughly a third (9% of all Catholic adults) are currently remarried. Among all U.S. Catholics who have ever been divorced, only about a quarter (26%) say they or their former spouse have sought an annulment from the Catholic Church. Indeed, many Catholics who have been divorced do not seem to view an annulment as necessary. The survey asked all U.S. Catholics who have been divorced and have not sought an annulment why they did not do so; the most common type of answer was that Catholics did not seek an annulment because they did not see it as necessary or did not want to get one (43%). Our survey found that many divorced and remarried Catholics who may not be eligible for Communion in the eyes of the church say they do receive Communion at least some of the time they attend Mass. While there were not enough respondents who were divorced and remarried without an annulment to analyze separately in the survey, they can be looked at together with Catholics who are currently living with a romantic partner outside of marriage, another group that received attention at the synod. In this combined group, 34% say they receive Communion every time they attend Mass – fewer than the 45% of all other U.S. Catholics who say the same. 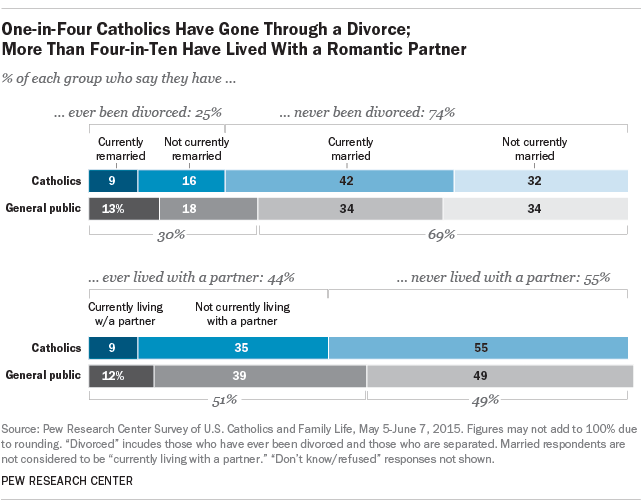 But still, only about three-in-ten (29%) Catholics who are divorced and remarried without an annulment or cohabiting say they never receive Communion, while an additional 5% say they never attend Mass.